A blog about green buildings and related sustainability topics in China. regime. This is a really clever move on the Chinese government’s part: they took advantage of low oil prices to both institute a higher fuel tax and allow gasoline prices to more closely follow market prices, while minimizing backlash from petrol consumers. China just raised their petrol tax to ~$0.54 per gallon, versus just ~$0.18 in America. As an American in Beijing, it’s absolutely embarrassing that my country, the supposed leader of the free world, continues to lag even the environmental progressiveness of China, a country who by reputation doesn’t care about the environment at all. BTW, I hope my blog shows that China’s horrible environmental reputation is undeserved, although they still have a LOT of work to do. For more background on the fuel tax increases, feel free to check out this Forbes report or Green Leap Forward’s post on the change. I will describe it briefly here. This change in the fuel price scheme will leave the price at the pump essentially unchanged from its current level of ~6.6 yuan per liter (~$3.63/ gallon), which has not been adjusted downward despite the steep decline in the price of oil. Under the new regime, pump prices will now be tied to manufacturing cost. 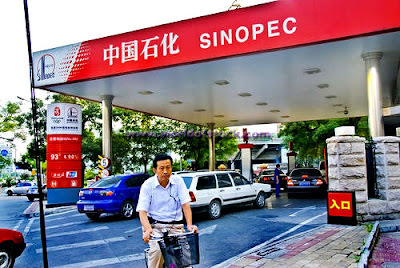 PetroChina and Sinopec, the two oil majors, will get a guaranteed profit margin of 4%, meaning Chinese consumers will essentially pay the cost of fuel plus 4% plus the new fuel tax. The fuel tax on gasoline will rise to 1 yuan per liter ($0.54 per gallon), up from 0.2 yuan ($0.11 per gallon). The revenue from the fuel tax increase will then be used to cut other driving-related taxes and tolls, making the tax “revenue-neutral”. Chinese leaders showed some real savvy with this fuel tax increase. First, they get rid of the burden of subsidizing cheap oil. The Chinese government (and it’s state-owned oil majors) lost a lot of money in the early part of this year since they had to buy their oil at high prices on the world market (half of Chinese oil is imported), refine it, and sell it at low fixed prices. This new pricing scheme eliminates that burden, and will force Chinese petrol consumers to bear future cost increases. I think this safety valve is probably a good thing, as its very important for public policy to be as aggressive and progressive as possible without risking significant backlash from those hurt by such policies. Second, Chinese leaders are able to advance the green agenda by raising the fuel tax. This will help price in some of the “externalities” currently not included in the price of gas. This is great from a policy perspective, but generally not popular among consumers, which is why the timing of this policy change was so savvy. Now that gas prices are low, the Chinese government and the state-owned oil firms are making windfall profits by buying the oil at low prices on world markets and selling it at high fixed costs to the market. There has not been significant widespread public backlash yet, and drivers have generally been able to bear the current price level. The government seized on this unique opportunity to quintuple petrol taxes without actually raising the price to the consumer. In fact, if oil stays at its current price for much longer, oil prices are actually likely to decline. Thus, consumers are happy with the move even though they’ll have to pay more for fuel. This doesn’t make OPEC happy, but as Green Leap Forward elegantly says, that’s a good thing for everybody else. 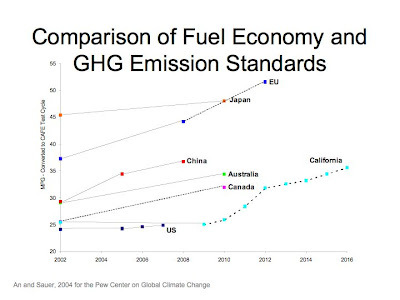 Chinese automobile fuel economy standards are already higher than America’s. And now their fuel tax is three times higher too. Yet again, America has fallen behind China in progressive public policy. The current situation is not just Detroit's fault, in many ways it is also the fault of pervasive stubborn free market ideology on both sides of the aisle in Washington, DC. This current financial crisis has really shown the limits of the free market economy. And the wild swings in oil futures over the past year have shown that no one can correctly predict the price of oil even a month from now. So how are corporations and individuals who purchase long-term assets that use energy going to cope? This uncertainty creates a disincentive to long-term investment in efficiency and clean fuels, which for many, many, many reasons, is so important. Clearly the free market is failing, since it is not providing the clean and efficient future we want. We need a big tax on oil right now to set a floor and ensure that investments in alternatives will be viable, even as oil continues to fluctuate wildly. Many people will tell Mr. Obama that taxing carbon or gasoline now is a “nonstarter.” Wrong. It is the only starter. It is the game-changer. If you want to know where postponing it has gotten us, visit Detroit. No carbon tax or increased gasoline tax meant that every time the price of gasoline went down to $1 or $2 a gallon, consumers went back to buying gas guzzlers. And Detroit just fed their addictions — so it never committed to a real energy-efficiency retooling of its fleet. R.I.P. Hopefully President-elect Obama heeds this advice and acts as soon as he comes into office. After all, he was the only presidential candidate who resisted calls for a holiday on our already measly gas-tax during the campaign. All the better for a carbon tax to happen now, while the US bails out Detroit with taxpayer money. While increasing gas tax, Beijing also eliminated many of the taxes and fees associated with owning a car in China, such as road taxes, registrations of this and that, etc (don't have the list on hand). So, I wonder what the long-term result will be. Now that fees associated with car ownership are eliminated, consumers could be less hesitant about buying a car in the first place. More cars on the road --> more absolute fuel purchased/burned + more sprawl/obesity/etc. This blog is the primary output of my research on the green building market in China and what role the built environment can play in cost-effectively reversing climate change. I completed this research while on a Fulbright scholarship in Beijing from August 2008 to June 2009. I plan to keep this blog up as long as it remains a relevant source of information on green buildings in China. I now have limited time to post, but I hope the site in its current form can at least be a useful jumping off point for everyone interested in green buildings in China. Many thanks to the US Department of State Fulbright program and the many friends and colleagues who made this possible. Carbon tax or cap and trade? My primary interest in green buildings centers on how the developmental problems China faces- severe environmental degradation, strained electricity infrastructure, worsening traffic, loss of traditional culture, etc- are highly interrelated. I believe that well-designed green, sustainable buildings and infrastructure could provide the solution to all of these problems while simultaneously boosting the economy. I have worked on green building projects in both the US and China, through roles with the Green Building Finance Consortium, EMSI and CTG Energetics, and I'm a US Green Building Council LEED Accredited Professional.